I always thought the cover was the best thing about this much feted Booker prize winner, so let’s see what the kids make of it. What do you think might happen to the tiger and the person? G. That won’t be true, there are some sharks in there and the sharks will try and eat the human – because they’re really good at getting up in the air and eating. C. And I think the sharks are one hundred, their age. A pretty accurate summation there. And probably a more satisfying ending than the one boshed together by Yann Martel. ‘And so it goes with god’ (my arse). 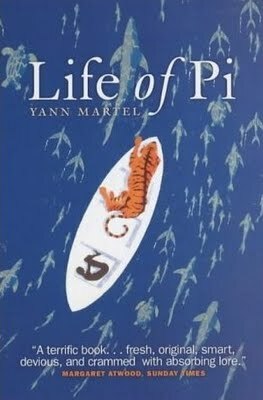 Tags: Booker Prize, Life of Pi, Yann Martel. Bookmark the permalink. I haven’t read this book, and I don’t think I need to now. Looking forward to more reviews!